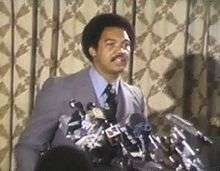 The Yankees signed free agent Reggie Jackson before the 1977 season. The New York Yankees returned to the Fall Classic after being swept by the Cincinnati Reds the previous year. In free agency, the Yankees signed slugging right fielder Reggie Jackson for US$2.96 million ($12,329,871 in current dollar terms) over five years and Cincinnati Reds ace pitcher Don Gullett for $2 million ($8,330,994 in current dollar terms) over six years. Two other key players were acquired by the Yankees through trades. Shortstop Bucky Dent was picked up from the Chicago White Sox for outfielder Oscar Gamble, pitcher LaMarr Hoyt, and $200,000. And after only one year with the Oakland Athletics, pitcher Mike Torrez was acquired in exchange for pitcher Dock Ellis and utilitymen Marty Perez and Larry Murray. After a lackluster first half, the Yankees finished strong, winning 38 of their last 51 games edging both the Boston Red Sox and the Baltimore Orioles by 2 1⁄2 games. In amongst the star-laden lineup was an emerging superstar in the left arm of Ron Guidry. Early in the season Guidry was moved from the bullpen into the starting rotation, finishing with sixteen wins against just seven losses with a 2.82 ERA. The Yankees advanced to the World Series after beating the Kansas City Royals in an exciting fifth and final 1977 American League Championship Series (ALCS) game, winning it with three runs in the top of the ninth on a string of singles and a costly error by George Brett. The National League champion Los Angeles Dodgers were skippered by Tommy Lasorda who was in his first full season as manager. The 1977 Dodgers became the first team to have four players hit thirty or more home runs in one season, as Steve Garvey hit 33, Reggie Smith hit 32, Ron Cey hit 30, and Dusty Baker hit 30. The deep pitching staff which led the National League in ERA, 3.22, were led by twenty-game winner, Tommy John and closer Charlie Hough with 22 saves. The Dodgers won 22 of their first 26 games, winning the Western Division easily by ten games over the Cincinnati Reds and then eliminated the Philadelphia Phillies in the 1977 National League Championship Series (NLCS) in four games. The matchup of the Yankees and the Dodgers hearkened back to the World Series matchups between the two teams of the 1950s. The Dodgers scored in the top of the first inning, when Davey Lopes walked and scored on a Bill Russell triple off of Don Gullett. Ron Cey made it 2–0 on a sacrifice fly. In the bottom of the inning, the Yankees responded with consecutive two-out singles by Thurman Munson, Reggie Jackson, and Chris Chambliss, scoring Munson. In the top of the sixth, Steve Garvey beat out a bunt and, with one out, attempted to score from first on a hit-and-run single to center field by Glenn Burke. Mickey Rivers, who did not possess a strong throwing arm, threw home. Replays showed Garvey clearly beat the tag but he was called out at the plate. The Yankees tied it in their half of the sixth when Willie Randolph hit a home run off Don Sutton. The Yankees took the lead in the eighth when Munson doubled home Randolph. Later in the inning, the Yankees loaded the bases with one out, but Dodger reliever Elías Sosa struck out Lou Piniella and retired Bucky Dent on a forceout to end the threat. The Dodgers tied it at 3–3 in the ninth. Dusty Baker led off with a single and was almost picked off first when pinch-hitter Manny Mota failed on a bunt attempt. Mota flied out, but Steve Yeager walked and pinch-hitter Lee Lacy drove Baker home with a single. In extra innings, the Yankees got their leadoff hitters on in both the tenth and eleventh innings, but couldn't score due to failure to lay down sacrifice bunts. Finally, in the twelfth, Randolph led off and doubled and Munson was walked intentionally. Yankee manager Billy Martin at first wanted Paul Blair, the next hitter, to try to sacrifice again, but after two failed attempts, Martin had Blair hit away and Blair singled home Randolph with the game-winner. With aces Ron Guidry and Mike Torrez having both pitched in Game 5 of the ALCS, Billy Martin was forced to use a sore-shouldered Catfish Hunter in Game 2. The Dodgers hit three homers in the first three innings off Hunter, as Ron Cey hit a two-run home run in the first, Steve Yeager a solo home run in the second, and Reggie Smith a two-run home run in the third. Steve Garvey hit a solo home run in the ninth. Burt Hooton pitched a five-hit complete game. Hooton made amends for his meltdown in Game 3 of the 1977 NLCS. About an hour before the first pitch, a fire had started in Public School 3, an abandoned elementary school a few blocks west of Yankee Stadium. During the game, ABC cut to a helicopter camera for an overhead view of Yankee Stadium and the surrounding neighborhood, catching the fire. Howard Cosell intoned, "There it is, ladies and gentlemen, the Bronx is burning." This became the title for a book and television miniseries focusing on the year 1977 in New York City. The Yankees struck for three runs in the first off Tommy John. Knowing that John was a control pitcher that liked to keep the ball down, the Yankee hitters' strategy was to go the opposite way. And, in the first, it paid off. Mickey Rivers led off with a double to right and scored on a Thurman Munson double to right. Reggie Jackson singled to left to score Munson and went to second when Dodger left fielder Dusty Baker fumbled the ball bare-handed. Lou Piniella then scored Jackson on an opposite-field RBI single to make it 3–0. Baker atoned for his first-inning error by connecting for a three-run homer in the third off Yankee starter Mike Torrez. The Yankees came back with single runs in the fourth and fifth on an RBI groundout by Rivers, who finished the game with three hits (including two doubles), and an RBI single by Chris Chambliss. Torrez settled into a groove after Baker's home run, shutting out the Dodgers for the rest of the way. Torrez finished with nine strikeouts in the complete-game win. With Don Sutton needing another day of rest, Dodger manager Tommy Lasorda started left-hander Doug Rau to counter the Yankees' left-handed power. Rau was rusty, having only pitched in relief in one game of the 1977 NLCS. After a relatively easy first inning, Reggie Jackson greeted Rau with a leadoff double in the second. Lou Piniella singled Jackson home with the first run and was doubled to third by Chris Chambliss. Lasorda then pulled Rau in favor of Rick Rhoden, resulting in a heated argument between the two on the mound. The Yankees scored two more runs in the inning on an RBI groundout by Graig Nettles and an RBI single by Bucky Dent. The Dodgers pushed across two in the third. Rhoden, a good hitting pitcher, hit a ground-rule double to left and Davey Lopes followed with a two-run homer off Yankee starter Ron Guidry. The Dodgers scored nothing else off Guidry, as he settled down and pitched a four-hit complete game. The Dodgers almost tied the game in the fourth when Ron Cey sent a drive to deep left that Lou Piniella leaped up and caught, robbing him of a home run. Jackson ended the scoring with an opposite-field solo homer off Rhoden in the sixth. Needing a win to send the Series back to New York, the Dodgers took out their frustrations in Game 5 on Don Gullett. Davey Lopes led off the first with a triple and came home when Bill Russell singled. In the fourth, the Dodgers broke the game open on an RBI single by Dusty Baker and a three-run homer by Steve Yeager. Baker added another RBI single in the fifth, Lee Lacy singled home a run, and Yeager batted in another run with a sacrifice fly. Reggie Smith completed the rally with a two-run homer in the sixth. The Yankees pushed across two runs each in the seventh and eighth; the two runs in the eighth coming on back-to-back homers by Thurman Munson and Reggie Jackson. Nevertheless, Dodger starting pitcher Don Sutton pitched a complete game for the win. Jackson's solo shot in the eighth came on the first pitch from Sutton, setting the stage for a memorable finale. Game 6, shifted the series back to New York, where 56,407 fans filled Yankee Stadium. Steve Garvey put the Dodgers on the board first with a two-out, two-run triple in the first off Mike Torrez. The Yankees came back and tied it in the second on a Chris Chambliss two-run homer after Reggie Jackson walked on four pitches. Reggie Smith put the Dodgers up 3–2 with his third homer of the Series, a solo shot in the third. Jackson hit a two-run homer in the fourth on the first pitch he saw from starter Burt Hooton to give the Yankees the lead. Lou Piniella made it 5–3 by adding a sacrifice fly. Once again, in the fifth with a man on, Jackson connected on the first pitch off Elías Sosa to make the score 7–3. In the eighth, Jackson strode to the plate, amid the chants of "REG-GIE, REG-GIE, REG-GIE! ", and drove the first Charlie Hough knuckleball he saw 475 feet (145 m) into the stands, becoming the first player to hit three home runs in a World Series game since Babe Ruth (in 1926 and 1928). The score was now 8–3. With his Game 5 first-pitch homer (in the eighth) and his four-pitch walk in the second inning of Game 6, Jackson homered on his last four swings of the bat in the Series, each off a different Dodger pitcher. Indeed, the last eight pitches delivered to Jackson in the Series were all productive for the Yankees—the four-pitch walk in the second inning allowed him to score on the Chambliss homer. The Dodgers pushed across a run in the ninth, but Torrez pitched his second complete game win of the Series. This was the first World Series televised by the ABC network since 1949, and the first since television of the Series started in 1947 not to be televised, at least in part, by rival network NBC. NBC had been the exclusive television network of the Series from 1950–1976, and had covered that year's Yankees–Royals and Dodgers–Phillies playoff series that year. It was also the first time that the participating teams' local announcers were not featured during game play on the network telecast, though the Yankees' Bill White and the Dodgers' Ross Porter did pre-game TV features and White handled the post-game celebration in the Yankee clubhouse after they clinched the title. White and Porter also split the CBS Radio play-by-play for the Series. This World Series cemented Jackson's legacy as a postseason performer, giving him the nickname "Mr. October". Jackson won the World Series Most Valuable Player Award and Babe Ruth Award. Lyle won the AL Cy Young Award. Nettles and Garvey both won Gold Glove Awards. The 1977 New York Yankees is one of the key plot points, along with the Son of Sam and the New York City Blackout of 1977, in the movie Summer of Sam directed by (Yankees fan) Spike Lee. In the film BASEketball, Reggie Jackson is shown hitting his third home run of the game. The 1977 Yankees season, including the World Series, is one of the subjects of Jonathan Mahler's 2005 non-fiction book Ladies and Gentlemen, the Bronx Is Burning, which was subsequently adapted into the 2007 ESPN mini-series The Bronx Is Burning. After the 1977 World Series, Melissa Ludtke, a reporter for Sports Illustrated, sued Bowie Kahn, the Baseball Commissioner, since she was denied access to the Yankees Clubhouse. She asserted her 14th Amendment right was violated. Ludtke won her case. ↑ "Playoff and World Series Stats and Results". Baseball-Reference. Sports Reference LLC. Retrieved December 28, 2009. ↑ Chass, Murray (November 28, 1976). "Yankees To Sign Reggie Jackson". Daytona Beach Morning Journal. New York Times News Service. p. 1B. Retrieved December 2, 2011. ↑ Donaghy, Jim (August 2, 1993). "Reggie Jackson homers in Hall". The Free Lance-Star. p. C2. Retrieved December 2, 2011. ↑ "Yankes snare a 'new Ford': Don Gullett". St. Petersburg Times. UPI, AP. November 19, 1976. p. 1C. Retrieved December 2, 2011. 1 2 Rothenberg, Larry (October 11, 1977). "Just Like Old Times ... Yankees, Dodgers In World Series: 1977 Matchup Stirs Baseball Memories". The Youngstown Vindicator. Associated Press. p. 15. Retrieved December 2, 2011. 1 2 Rothenberg, Fred (October 13, 1977). "Dodgers wallop four homers off Catfish, beat Yankees". Williamson Daily News. p. 14. Retrieved December 2, 2011. ↑ Forman, Sean L. (ed.). "1977 Los Angeles Dodgers Batting, Pitching, & Fielding Statistics". Sports Reference LLC. Retrieved December 2, 2011. ↑ "1977 World Series Game 1 - Los Angeles Dodgers vs. New York Yankees". Retrosheet. Retrieved September 13, 2009. ↑ "1977 World Series Game 2 - Los Angeles Dodgers vs. New York Yankees". Retrosheet. Retrieved September 13, 2009. ↑ "1977 World Series Game 3 - New York Yankees vs. Los Angeles Dodgers". Retrosheet. Retrieved September 13, 2009. ↑ "1977 World Series Game 4 - New York Yankees vs. Los Angeles Dodgers". Retrosheet. Retrieved September 13, 2009. ↑ "1977 World Series Game 5 - New York Yankees vs. Los Angeles Dodgers". Retrosheet. Retrieved September 13, 2009. 1 2 "1977 World Series Game 6 - Los Angeles Dodgers vs. New York Yankees". Retrosheet. Retrieved September 13, 2009. 1 2 3 4 5 6 "Yanks Win Opener; Rhoden Gets Loss". The Palm Beach Post. October 12, 1977. p. D. Retrieved December 2, 2011. ↑ Grimes, William (March 30, 2005). "A City Gripped by Crisis and Enraptured by the Yankees". New York Times. 1 2 3 4 "1977 World Series | Game 6". MLB.com. October 18, 1977. Retrieved December 12, 2011. ↑ Anderson, Dave (February 6, 1978). "Jackson Hopes for Nice, Quiet Season as One of the Boys". The Miami News. p. 1B. Retrieved September 27, 2011. ↑ Symposium, Journalism & Women (2012-01-27). "Melissa Ludtke - JAWS". JAWS. Retrieved 2016-10-13. Cohen, Richard M.; Neft, David S. (1990). The World Series: Complete Play-By-Play of Every Game, 1903–1989. New York: St. Martin's Press. pp. 365–370. ISBN 0-312-03960-3. Reichler, Joseph (1982). The Baseball Encyclopedia (5th ed.). Macmillan Publishing. p. 2203. ISBN 0-02-579010-2. Forman, Sean L. "1977 World Series". Baseball-Reference.com — Major League Baseball Statistics and History. Retrieved December 9, 2007. 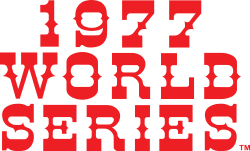 History of the World Series - 1977 at The SportingNews. Archived from the original on 2008.